I've made meringues a few times recently, and here I've used them in a frozen dessert that is a bit like an ice cream. The original recipe calls for the cream-meringue mixture to be frozen in a ring mould (English spelling) and for strawberries to be piled in the middle, and, if done this way it does look quite spectacular. This time I used silicone pyramid moulds, which made good sized individual servings. One of the best things about this dessert is that you can accompany it with almost any fruits or even a chocolate/caramel sauce. I bet roasted balsamic strawberries would be heavenly too! Try adding some berries to the meringue mixture before freezing, for a rippled effect. I've used Cointreau to add some flavour, but you could use brandy or orange juice if you prefer. Fruit of your choice to serve with - strawberries, raspberries etc. Place the cream into a bowl with the icing sugar and Cointreau, whip until it stands in soft peaks. Break the meringues into pieces and fold into the cream. Spoon into individual moulds, or a 2½ pint (1.5 litre) ring mould lined with foil or cling film. If using silicone baking moulds, you don't need to line them, as once frozen, they pop out quite successfully. Cover with cling film and freeze for at least 6 hours or overnight. Turn out onto serving dishes 20 minutes before serving and place in the fridge to soften slightly, or you can serve straight from the freezer if preferred. Serve with the fruit. I've just noticed that this month's Sugar High Friday theme is meringue, so I am sending this to Melly at One Messy Kitchen. This event was created by Jennifer at The Domestic Goddess. You can see all the previous themes here. Those look so luscious! 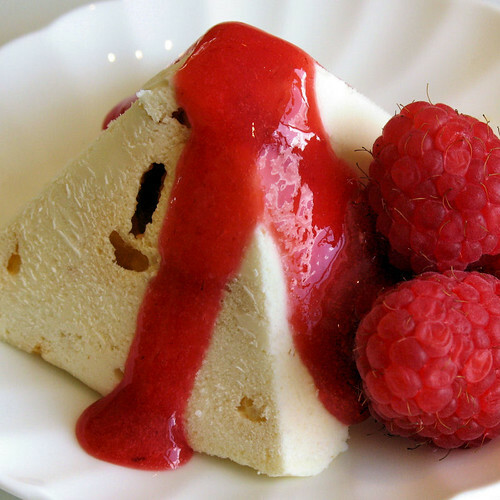 The recipe reminds me a little of a semifreddo, which I love. I must try them! They look great Nic! Love the picture, as always yours are fantastic. Nic, I love this concept! I'm always looking for new semifreddos, granitas, anything that doesn't involve that derned ice cream maker that I'll buy when I finally have a decent income. That looks fit for Royalty! Where did you get those moulds? they are fantastic. Lovely dessert Nic and your pic looks amazing as always. I will have to keep this recipe in mind, I always have leftover egg whites from making ice cream. It looks great! Since I love meringues I have to try this recipe. It looks gorgeous and for sure is extremely delicious. Nic, I don't think I have ever tried something like this - it looks so pretty! It looks light and fresh and that orange touch... YUM! Hey Nic, what can I say, except for wow? I've never tried to make meringue before but your instructions seem simple enough even for me. :) Very lovely. Thanks! i love frozen mousses too nic... perfect for the summer! Using meringue in ice cream sounds like a great idea! I really like the pyramid presentations with the sauce dripping down. i love that you put "English spelling" after "mould"! SGCC - they are a bit like a semifreddo, no raw eggs though! Jan - aww, thanks hon! Judith - thanks! There are quite a few recipes that don't need an ice cream maker, and they are quite good I must say! bbaking - thank you so much! Chris - I hope you do try them! Beth - as I said in the email - let me know if you can't locate one. Brilynn - meringues are great to use up egg whites! Grace - thank you, I agree about the cool shape. Nina - don't chuck the egg white out, there's loads of recipes to use them up in! Jo - thanks for visitng and for your comments! Raquel - they tasted pretty good - I'd definitely recommend them! Patricia - they are easy to make, do try them! Mansi - ha ha, I'm no pro!! I might be after reading your great article though! Matin - welcome and thank you! Ann, Miri and Holler- thanks! Dragon - what are you waiting for, you can use ugly ones or 'gone wrong' ones for this! Kevin - they give a little sugary something to the ice cream! Valli - I tried it with the balsamic strawberries and all I can say is mmmmmm.....! Diva - thanks! I was beginning to think I was spelling it wrongly! I love that photo! This looks like such a dramatic dessert on the plate. Very nice work! What a wonderful idea using pyramid moulds Nicisme. What a beautiful picture and such a great idea! 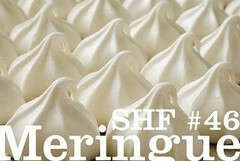 I am always looking for something to do with meringues as I make meringue cookies quite often. Your Frozen Meringue Cream sounds perfect. Oh, it's a pyramid of lusciousness! Wow, this is great! I love meringue but usually as a topping to my pies or as a pavlova. Thanks for an amazing recipe, Nic. Very nice. Wish I had a mold for that. Love the pictures! Your recipes sound wonderful, I've enjoyed wondering around your blog. It does look impressive like a delicious Egyptian pyramid, hehe. I must try this recipe. What a show stopper. WOW. Geez...now you've got me lusting for a pyramid shaped mould.